I've wanted to post in this thread for a while, but have been sidetracked by the actual weather following the SSW, but with the current rain, drizzle and generally rubbish weather, I'm taking a break from the MOD! I think this thread is excellent and look forward to following it avidly. 1. The phrase 'seasonal wavelength changes' is one I've seen regularly in posts relating to teleconnections. I'm unsure what this means, although I assume it relates to the meandering of the jet stream in some way. So could anyone please provide an explanation of: the wavelength of what is changing, how does it change, why does it change, and how might that impact the UK at various times of year? 2. A lot of discussion I've read has been related to winter. I'd like to know what teleconnections can tell us about summer, I know the strat is out of play, but what can give an indication of summer weather patterns a few weeks in advance? Thanks in advance and very best regards. I just wanted to say that I have recently taken on some additional business commitments which will take up the small amount of free time that I have available for an extended period. I will now only be able to post very occasionally and perhaps not at all during the next few months. Needless to say, I will not have any time to develop this learning thread as I had wished to. I apologise to anyone who was expecting to see greater activity on here. I hope that others will continue to contribute to and support this thread with questions and answers. Perhaps someone might like to respond to @Mike Poole and his queries in the post just above this message. This is exactly what this thread is intended for. I will attempt to do the occasional post, though as with you my time will be constrained when back studying next week. I will hopefully formulate a response to Mike in the upcoming days . On a separate note, I will be transferring across a detailed update to the 'Hurricane Tutorial' written back in 2005 in preparation for the upcoming North Atlantic Hurricane Season. It should be fully updated and available on here within two weeks, anyone interested should occasionally check in the Hurricane Tutorial thread and possibly any new thread for the upcoming season where it will likely be added to. Seasonal Wavelength Change : With regard to the notion of teleconnections, this relates (as you mentioned) to jet stream undulation/amplitude. Winter is characterized through a high poleward temperature gradient, resulting in increased upper atmospheric zonal winds (Jet Stream). High velocity upper atmospheric winds rarely reflect themselves in a meridional (high amplitude) setup, partial reasoning at least why winter weather is dominated by interchangeable surface setups (Unsettled). In summer months, with the considerable weakening of the polar vortex the temperature gradient is far less pronounced, resulting in lower upper atmospheric zonal winds (Jet Stream). This can and usually translates to a more amplified pattern being seen in the upper winds. In short, summer is characterized by short wavelength (increased amplitude) jet stream (Slower Aswell) setups and this is reversed in winter months. A possible approach to this (for beginners), is to consider why blocked surface patterns gain so much interest in the winter period. It will have weak correlation with fanatical hopes of snowmageddon, but on a serious note it provides respite from the broad continuum of strongly zonal conditions. Wavelength changes can change more abruptly on reduced timescales, these being induced by changes in the global wind oscillation (GWO), MJO phases etc. Many thanks for taking the time to reply to my question, @MattTarrant your answer is very clear, so I will know when reading posts about teleconnections in future what this refers to. I will have a look at the papers that you have given links to. I never intended to directly define wavelength, my answer was portended to help Mike with his questions. Wavelength in it self is does not require much talk, I intended to discuss around the topic to help promote Mike's wider thinking. This specialist "Teleconnections" thread was set up to examine and learn more about the main drivers and influences on the broader global weather patterns and how these drivers interact with each other and which are the more dominant ones. Some of the posts have already focused on the great importance of understanding the major role played by AAM (Atmospheric Angular Momentum) and the torques. Several of us have discussed the GSDM (Global Synoptic Dynamic Model) which was jointly developed by leading meteorological scientists Edward K Berry and Dr Klaus Weickmann while they were working at NOAA in the late 1990s and earlier years of this century. They also devised the GWO (Global Wind Oscillation) as a way of plotting and measuring the amounts of relative global AAM, FT (frictional torque) and MT (mountain torque) at different phases of the cycle. They became leaders in this specialist research which has been used to assist in understanding impacts on global weather patterns and upcoming changes up to a few weeks ahead. Unfortunately, they left NOAA several years ago and it seemed that their vitally important work had ceased with a great loss to advances in meteorological science. We have been trying to track them down and recently found an email address for Ed Berry. I sent Ed an email and I was delighted when he replied almost immediately. He explained that Klaus Weickmann retired several years ago. Ed Berry (Senior Weather-Climate Scientist) continues his excellent work on the GSDM and retains his lifelong passion to develop the model and its meteorological applications further.  We have exchanged a few more emails with Ed and he is very supportive of the work that we are doing on this thread. I hope that we can persuade Ed to post on here in due course. Obviously one needs to follow the full presentation to see what is behind these charts. There is also a focus on several earlier events including winter 2012/13. I hope to have many more exchanges with Ed as well as with Victor.. Analysis of cyclone tracks and precyclogenesis flow conditions show us that El Niño can shift the preferred cyclogenesis position over the Gulf Stream which influences the cyclone's track across the North Atlantic. Northern Europe is located at the end of the North Atlantic storm track and the low pressure systems that bring this area precipitation typically form above the Gulf Stream or at the southern tip of Greenland. A recent study published in the Journal of the Atmospheric Sciences, by Sebastian Schemm, Laura Ciasto, Camille Li and Nils Gunnar Kvamstø reveals how ENSO affects the formation of low pressure systems over the Gulf Stream area and consequently their tracks across the North Atlantic. The results are based on the analysis of the wintertime precyclogenesis flow across North America during three ENSO variants in an observation-constrained reanalysis dataset. Location: Wellington, NZ, about 120m ASL. Does anyone have any functioning AAM or torque monitoring sites anymore? All the usual suspects stopped working around June. Thanks. In the Atlantic, the cut-off lows have already been present from August onwards. These cut-off lows have been the breeding ground for several (sub-)tropical cyclones, like Debby, Ernesto, Joyce and Leslie. It is quite unusual that we see so many subtropical cyclones developing in the Atlantic from non-tropical origin. The extratropical re-intensificaiton of Lesile a few days ago was also aided by a southward-digging upper-level trough. Likewise, in Europe there have also been some cut-off troughs already. One of these caused a subtropical cyclone to develop in the Mediterranean (the 'Medicane') that is active as of 28-9. In the next few days, yet another cut-off low will develop in the Mediterranean with the potential to take on some subtropical characteristics (see animation below). Looking at this flow pattern makes me wonder what is causing this unusual flow configuration. What I found is that we can find at least part of the answer to this puzzle in deviations from the jet stream. During August, the jet stream has been located unusually far to the north, as shown in the image below. 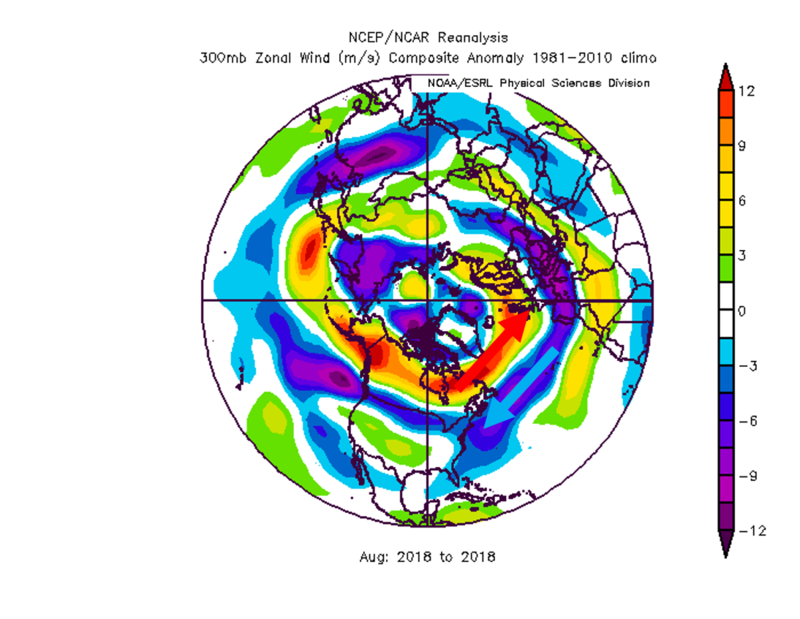 That image shows the zonal (west-to-east) anomalies of winds at 300 hPa (8 km height) in August. At the latitutde of the UK, westerlies have been stronger than normal (implying a stronger jet). On the other hand, westerlies have been weaker than normal further south (implying a weaker jet). This corresponds to a northward displacement of the jet. The pattern observed above matches the large amount of cutoff lows well - when the jet is located far to the north, troughs often dip far to the south and become cut-off from the main flow. If the jet were to be located more to the south, cut-off lows would be less frequent. An interesting question is why we observe the northerly position of the jet and the large amount of cut-off lows in the Atlantic sector. Maybe this is linked to variations in the GWO? Since this pattern resembles the pattern of the summer to some extent (northerly position of the jet and +NAO), I suspect that any indicator must have been consistent already for most of the summer. Plots show some of the features: MJO, SUB-MONTHLY, & RAPID TRANSITIONS. Plots show some of the features: ENSO, QBO, & TRENDS. 1. Nicholas Shiraldi - Albany for the GEFS AAM and GWO plots - Note that this has not updated since June 28th 2018 due to ongoing GFS technical problems which we are assured will be resolved in due course (but no date given yet). 2. SCW (South California Weather Notes) - this site provides a vast number of links although some are no longer available (such as the NOAA map room for AAM etc). It is well worth exploring what's on offer, including some useful archive data. For the GWO previous/current (but not forecast) plots go to the "Quick Link" near the top of the page and click on GWO/FNL. The chart sometimes appears as a silhouette but will copy okay. This is the "final analysis" using GFS data. Klaus Weickmann developed this as a way of checking the forecast output against what actually transpired. It is very useful as it doesn't appear to have the same strong -ve biases that GEFS are known to have. it is updated towards the end of each day. 3. Dr Victor Gensini - a research scientist in this field has been developing his own site during the last year. It is still evolving but already has some extremely useful data. Victor has been attempting to correct the GEFS -ve bias but his source data is suffering from the same technical faults - so not reliable right now. He also includes CFS output which has a rather +ve bias and allowances need to be made for that. He plans to process and add torque data in due course. Victor Gensini and Ed Berry are in regular contact with each other and may do some joint work providing that they can get the financial backing (always a problem in this area). You can have temporary access as a guest and can view around 10 different papers in a 24 hour period. If you want to view more, you will need to register (which is free as they rely on voluntary donations). Or in Chrome for example, clear your cookies from the last hour, simples.